Dr Chengxue (Helena) Qin has considerable experience in medicinal chemistry and cardiovascular pharmacology through her unique PhD training obtained from University of Melbourne in 2010. Dr Qin's PhD project encompass design, synthesis and profiling an array of novel red wine-flavonols derivatives for treatment of cardiovascular. Excitingly, this group of compounds is now completing phase-II clinical trials in heart attack patients. 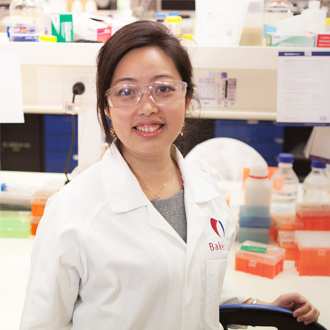 In 2011, Dr Qin was recruited by Professor Rebecca Ritchie to the Baker Heart and Diabetes Institute to develop novel pharmacological therapies for various cardiovascular disease (e.g. heart attack and diabetes). Her research mainly focuses on formyl peptide receptors, a group of protein involved in the regulation and resolution of inflammation. Dr Qin's studies provided the first evidence that the prototype Cmpd17b is a biased agonist at FPRs, enabling superior cardio-protection over conventional FPR ligands. This cutting-edge platform technology was recently published Nature Communications, and is attracting significant interest from venture capital, big pharma and media. Dr Qin's achievements have also been recognised by numerous highly competitive and prestigious awards including BPS/ASCEPT Outstanding Young Investigator Award; CSANZ Ralph Reader Prize (Basic Science). Dr Qin’s international profile has been recognised by prestigious speaking invitations, including Keystone Symposium, Cambridge University as well as several universities in China (Shandong, Shanghai, Beijing). In addition to traditional academic achievements, Dr Qin has demonstrated a strong passion for commercialisation of research outcomes. She is the Vice-President for the Australia-China Scientist and Entrepreneurs, where Dr Qin provided entrepreneurial training and mentoring for budding scientists and tech startups.